51st match of IPL 2018 being played in M Chinna swami Stadium Bengaluru. This match is a knock-out match for RCB while on other hands SRH won't be affected by match result. 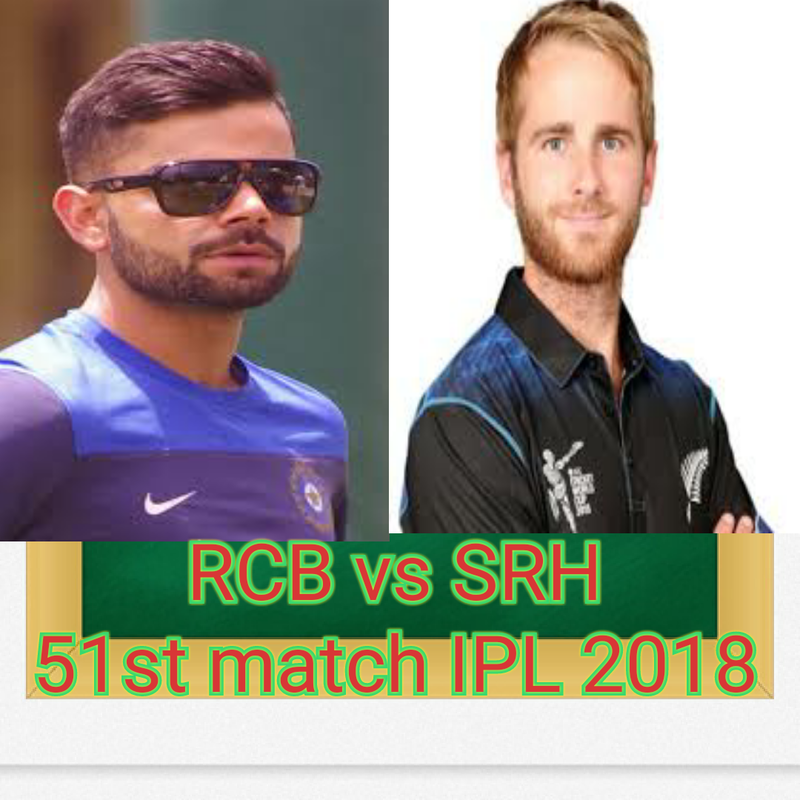 SRH won the toss and elected to bowl first. Parthiv Patel started the inning with Virat Kohli. Parthiv Patel lost his wicket in 1st over. In first power play of 6 overs, RCB scored only 44 runs for the loss of 2 most valuable wickets. Virat Kohli scored only 12 runs and bold by Rashid Khan. Sandeep Sharma got the wicket of Parthiv Patel in very first over of the inning. He scored only 1 run. AB de Villiers and More Ali still batting after 6 overs. AB de Villiers (69 of 39, 12 4s and 1 6s), Moeen Ali(65 of 34, 2 4s and 6 6s), Grand hone(40 of 17, 1 4s and 4 6s) and Sarfaraz Khan also played an amazing inning of 22 in just of 8 delivery with 3 4s and 1 6s. Rasid khan got 3 wickets the wicket of Kohli, De Villiers, and Moeen Ali. RCB scored 218/6 in 20 overs. Alex Hell's(37), Shikhar Dhawan(18), Manish Pandey(62) and Kene Williamson played a great inning of 81 in just of 42 delivery in which he smashed 7 4s and 5 6s but couldn't achieve team to win. SRH scored 204/3 in 20 overs and lost the match by 14 runs. RCB won the match by 14 runs and got 5th position in point table with 12 points. AB de Villiers declared man of the match.